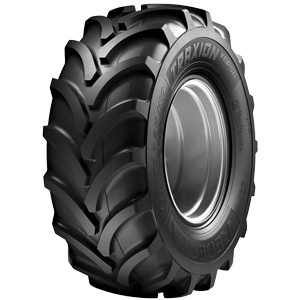 The Vredestein Traxion Versa is a state-of-the-art agro-industrial tyre, ideal for telehandlers, backhoes, and compact wheel loaders operating on feedlots and for general around-the-farm maintenance. It is specifically designed for use on soft surfaces where optimal traction and flotation are required. Incorporating the unique Traxion design concept, the Versa ensures exceptional comfort and traction in the field..
A large cleat surface in the comfort zone provides extensive ground contact for optimal flotation.. The extended curved cleats enhance traction. A reinforced sidewall and stabiliser ring provide robust damage protection. E&OE. *Physical measurements of product may be within +/- 2% of what is stated here. Please note that not all sizes listed may be stocked in Australia. Please contact us if further clarification is required.